From our Early Chinese Collection, a fine and large Ming Dynasty lead-glazed pottery ridge (roof) tile, 15th-16th century, Hongzhi through Jiajing Period (1488-1566), depicting a guardian-demon ferociously modeled with bulging eyes, protruding fangs, pointed horns, thick musculature, and standing in defensive posture astride a cloud-swirl with fists clenched around what would have been a weapon made of wood or iron, now since rotted away and lost to time. This cloud-swirl between the demon and the semi-cylindrical tile base, is actually there in part to mask a hollow tubular cavity into which a peg protruded upwards into the figure, helping secure it to the roof. Ming era lead-glazed pottery ridge (roof) tiles like the present example, are well-known on the auction circuit and well-documented throughout the secondary literature. See Christie's Sale 5812, Lot 208, also Sale 5558, Lot 330, and see also Ming Ceramics in the British Museum by Jessica Harrison Hall, p.516-536. Depending upon the actual figure modeled, ridge tiles like these were crafted either to ward off evil spirits from the structure (usually an imperial palace, tomb, temple, or residence of an important private family), or to bring good fortune to the occupants inside. Examples similar to ours in this half-beast / half-man form are known to have come from important structures such as the Feihong Pagoda in Guangsheng Monastery, but we do not know the precise origin of this particular piece. 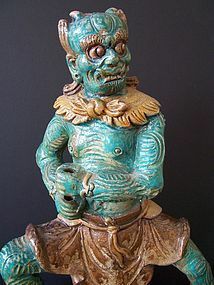 Regarding glaze coloration, tiles in the "sancai" color scheme (green, amber, and cream) are the most commonly encountered. Tiles in the "fahua" color scheme (blue, turquoise, purple, yellow and cream) are less common, and less common still are these examples in turquoise and brown. Size and Condition: 16 3/8 inches tall on the base, 15 1/4 inches tall off the base, 10 inches wide. Due to their exposure to the elements over the centuries, many ridge tiles on the market these days have undergone restoration to one degree or another, and very often have had their glazes retouched. The more pristine they look, the greater likelihood the glaze has been retouched. But here we are proud to present a piece that is totally free and clear of any damage or restoration whatsoever. Apart from some dryness to the glaze and some minor mottling and flaking which is expected on a truly untouched piece, this example has survived remarkably well, and is in excellent original un-retouched condition. As with any of our Early Chinese pieces that have not yet been TL tested, we have no problem conditioning sale upon the outcome of an Oxford TL test.